The W Hotel Atlanta Downtown’s lobby entertainment hub had to overcome highly reverberant acoustics and provide equal volume, stereo and intelligible audio over a very wide and complex space, so the loudspeaker systems also had to meet the design aesthetics at the heart of this world-class hospitality brand. 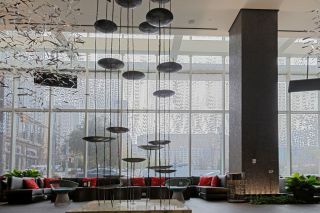 Toronto interior design company Βurdifilek created an urban oasis within the W Atlanta Downtown Hotel. Designers Diego Burdi and Paul Filek reinterpreted the Living Room as a verdant sanctuary that mimics the lushness of Georgia, while maintaining the brand’s celebrated cosmopolitan edge. The final architectural design presented acoustic challenges. Three-story glass windows and a polished marble floor made for a highly reverberant space that could not permanently accommodate more than low-volume ceiling speakers. For over seven years, this situation combined with existing speaker technologies, made many of the needs of the Living Room difficult to resolve. With the recommendation of Tectonic representatives EDA Pro AV and audio/visual provider Atlanta Sound Works, Tectonic was able to provide a real-time demonstration of a proposed solution for this space. Tectonic rolled-in 25-foot lifts to place a pair of PL-12 flat panel Resonant Mode Loudspeakers into very nearly their final locations. Atlanta Sound Works engineered an elegant mounting system that utilized the Tectonic PL panel's VESA compatible capabilities. Custom-fabricated ceiling mounts were fitted with standard VESA brackets to attach to the Tectonic PL-12s. Adjustment points were provided by this design to allow for aiming of the panels. Speaker cables were routed internally through the mounts to provide a clean look to the final installation.